Blog of Sara (Butcher) Burrier :: Sara B Illustration: February Raffle! Since my last raffle here on the blog, I've wanted to host another one. So this month I am, and there will be 4 winners! ❤ Starting tomorrow, February 1st, every time you spend $25 at my Etsy shop your name gets entered into the RAFFLE ! Every Thursday during the month of February a name will be drawn. Your name never leaves the raffle unless you win! 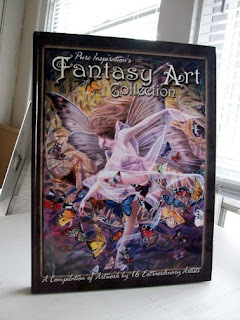 A handsigned, personalized, and dated edition of Pure Inspiration's "Fantasy Art Collection". A heavy and gorgeous book filled with masterful fantasy artists including Shelia Wolk, Josephine Wall, K.Y. Craft, and more! Even the cover is embossed! Many artists, many stories about their inspirations, and SO many stunningly beautiful pages of artwork. The first drawing will be held on February 4th. The announcement will be made here and on my Facebook Fan page. Winners will be notified through email and through Etsy's convo.